American humorist and writer; born Dec. 27, 1847, at Janoshaza, Hungary; received a rudimentary secular and Talmudic education at home. At Vienna, where he had engaged in business, he obtained a free scholarship at the Theater Academy. Subsequently (1872) he accepted engagements with the Vienna Stadttheater (with which he remained over two years) and with the Duke of Meiningen's troupe at Berlin (1875). 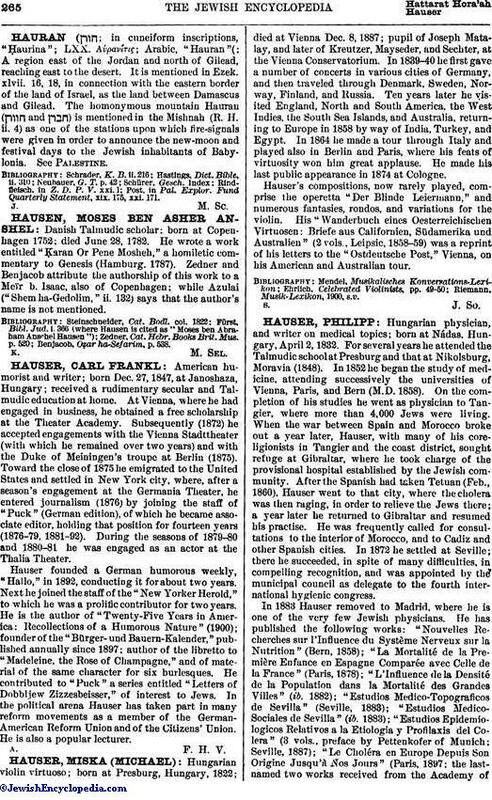 Toward the close of 1875 he emigrated to the United States and settled in New York city, where, after a season's engagement at the Germania Theater, he entered journalism (1876) by joining the staff of "Puck" (German edition), of which he became associate editor, holding that position for fourteen years (1876-79, 1881-92). During the seasons of 1879-80 and 1880-81 he was engaged as an actor at the Thalia Theater. Hauser founded a German humorous weekly, "Hallo," in 1892, conducting it for about two years. Next he joined the staff of the "New Yorker Herold," to which he was a prolific contributor for two years. He is the author of "Twenty-Five Years in America: Recollections of a Humorous Nature" (1900); founder of the "Bürgerund Bauern-Kalender," published annually since 1897; author of the libretto to "Madeleine, the Rose of Champagne," and of material of the same character for six burlesques. He contributed to "Puck" a series entitled "Letters of Dobbljew Zizzesbeisser," of interest to Jews. In the political arena Hauser has taken part in many reform movements as a member of the German-American Reform Union and of the Citizens' Union. He is also a popular lecturer.